So, it’s not going to surprise you when you see my photos with my refashioned band t-shirt. Let’s just pretend I’m a rocker. K, thanks. I left off the neck and sleeve bands and did a rolled hem for a more raw look to match my faux rocker presence. I added a stabilizing straight stitch to the neck for good measure. Now, on to the leather pants I’m wearing! A friend at work gave them to me and they fit perfectly. She said that they were altered to fit her years ago and look at this! They fit me. I owe her a custom dress now! Seriously, these leather pants ooze money. They’re really nice. Adding that to the never ending sewing list! One more thing before I go. More proof that I’m a professional dork. Air guitar! I will now sign autographs in my favorite lipstick. I’m out! Yeah baby, yeah. Your air guitar skills in your new rocking tee leave me breathless. lol – air guitar! Great t-shirt save! 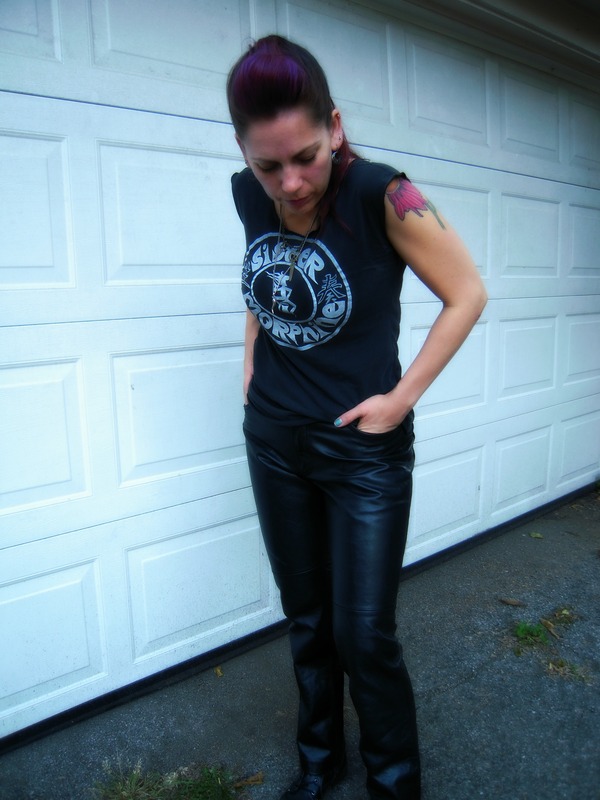 Great leather pants too – so nice of your friend to give them to you! I could use a couple black shirts for the restaurant too. We’ll see. I’m kind pumped to make more regular clothes for my new job at the dress shop. Weeee! Looks ace – did you take off the sleeves completely? I’m thinking of doing the same. Best air guitar ever (& t-shirt save too)! Love this look on you, rocker babe!